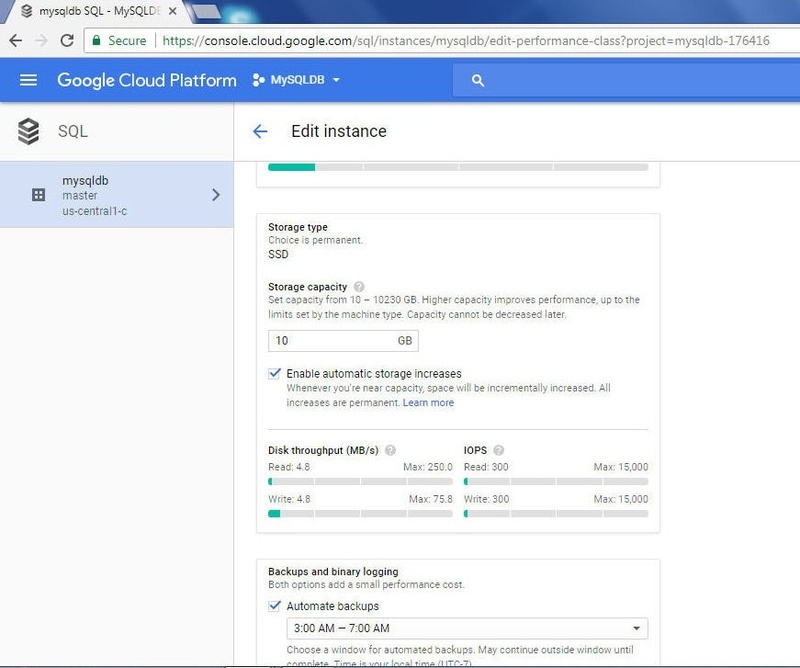 Google CloudSQL is a lightweight managed service for databases with support for MySQL and PostgreSQL. 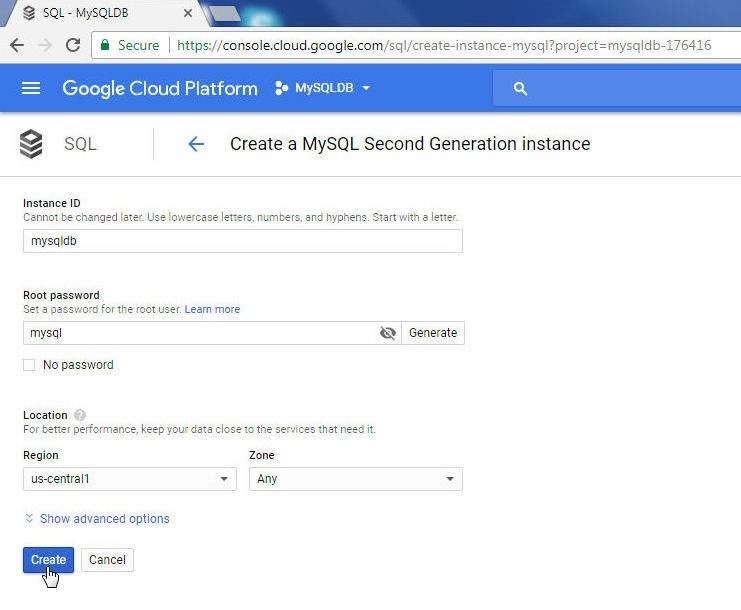 CloudSQL supports most of the features supported by a local installation of MySQL and PostgreSQL databases. 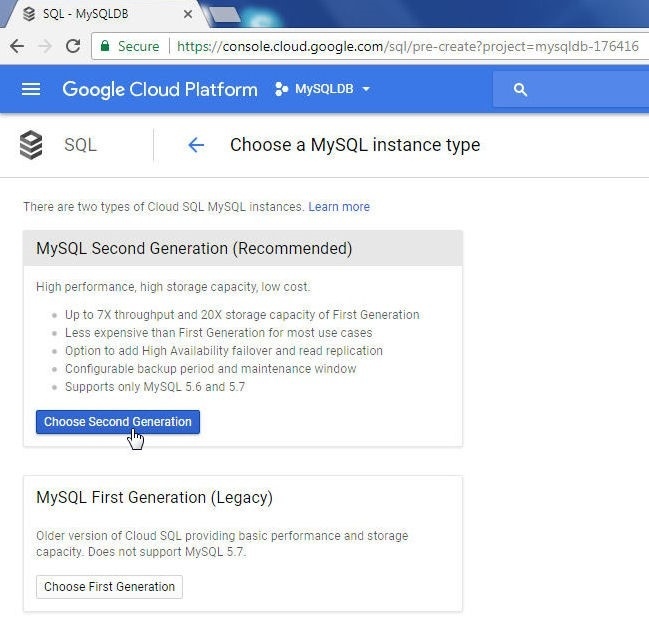 Second Generation instances on CloudSQL support MySQL 5.6 or 5.7 and provide up to 208GB of RAM and 10TB of storage on the InnoDB storage engine. An option is provided to increase the storage automatically if required. 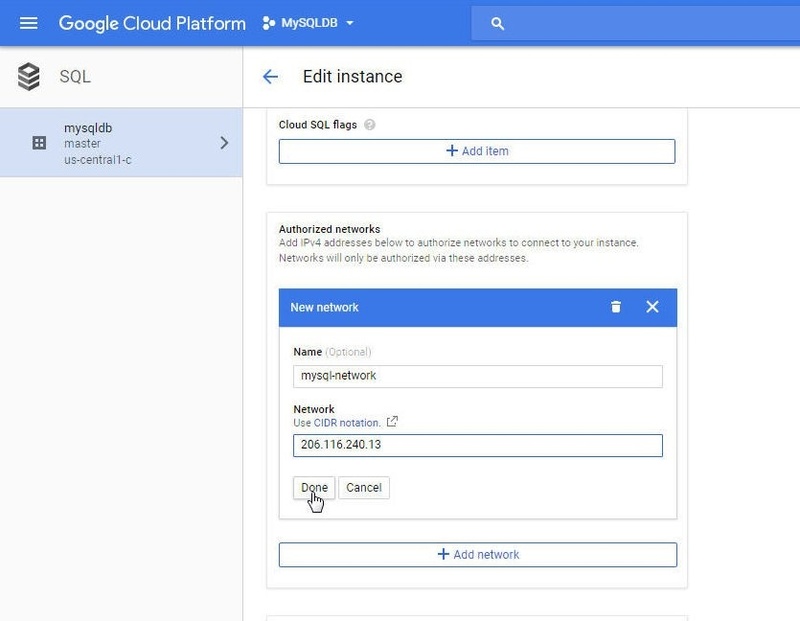 Cloud SQL Proxy and Secure Sockets Layer (SSL) may be used for secure connections. 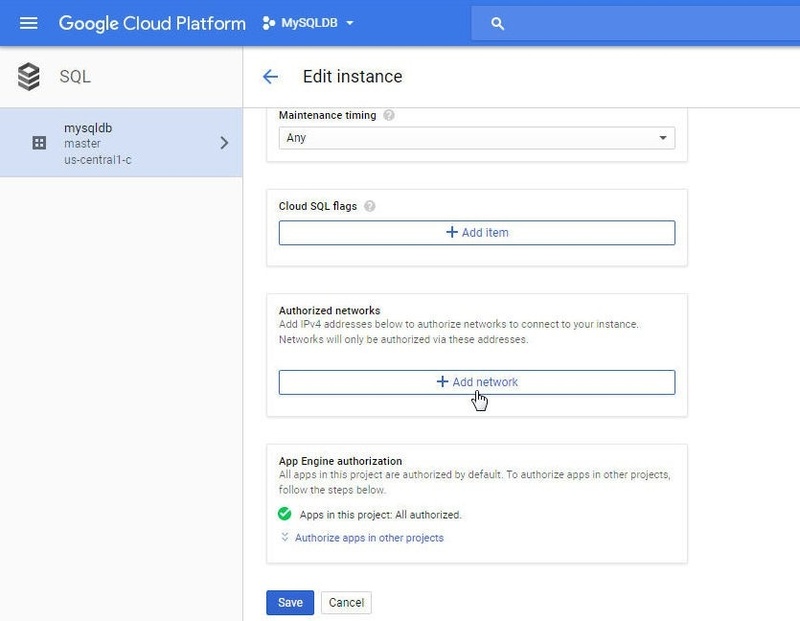 Being a managed service on the Google Cloud platform, CloudSQL is able to integrate with some of the other Google Cloud platform services, such as data replication across multiple zones with automatic failover. Some of the features of a full installation of MySQL database, such as user-defined functions, performance schema, the FEDERATED storage engine, the SUPER privilege, and the InnoDB memcached plugin, are not supported in CloudSQL. Some SQL statements are also not supported. For CloudSQL features (supported and unsupported), refer to CloudSQL Features. Toad Edge is Quest’s latest database management and development tool for open source databases. Toad Edge presently supports only the MySQL database platform, but support for other open source databases including PostgreSQL is currently under development. A free 30-day trial of Toad Edge is available here. Toad Edge is lightweight but still full-featured. Toad Edge features include a Connection wizard, SQL Worksheet with SQL code-assist, management of database objects and user privileges, Import/Export wizard to import/export data with support for CSV, SQL and Zip files, schema comparison and sync, and database snapshots. In this tutorial we shall discuss using MySQL database on CloudSQL with Toad Edge. This tutorial has the following sections. 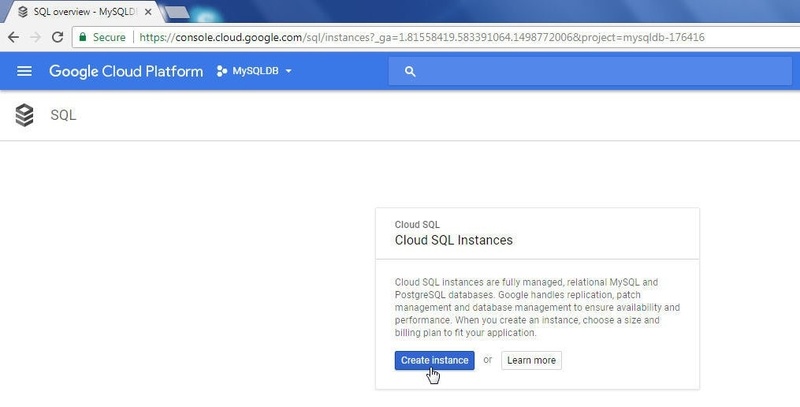 A Google Cloud Platform billing account is required, which may be created at https://console.cloud.google.com/billing. 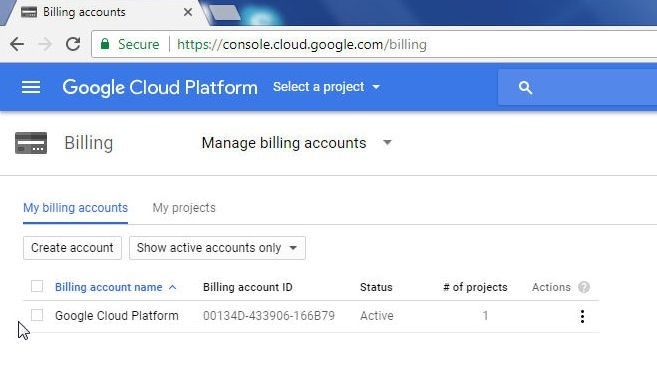 A Google Cloud Platform Billing account is shown in Figure 1. 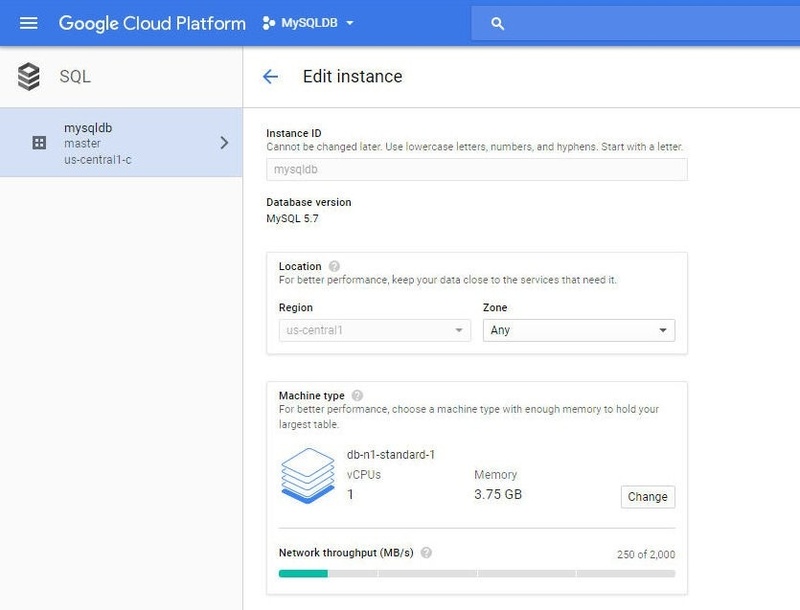 Google Cloud Platform Free Tier account provides a free trial for the first year. 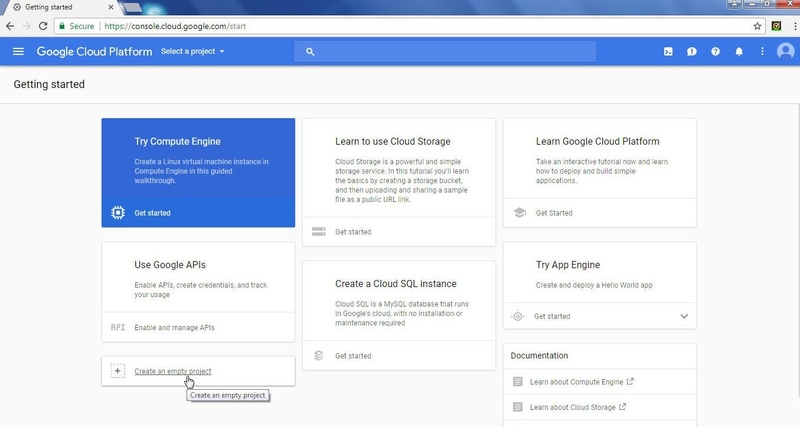 A Google Cloud Platform project is required to be created to use CloudSQL. To create a project click on the Create an empty project link on the Getting started page as shown in Figure 2. 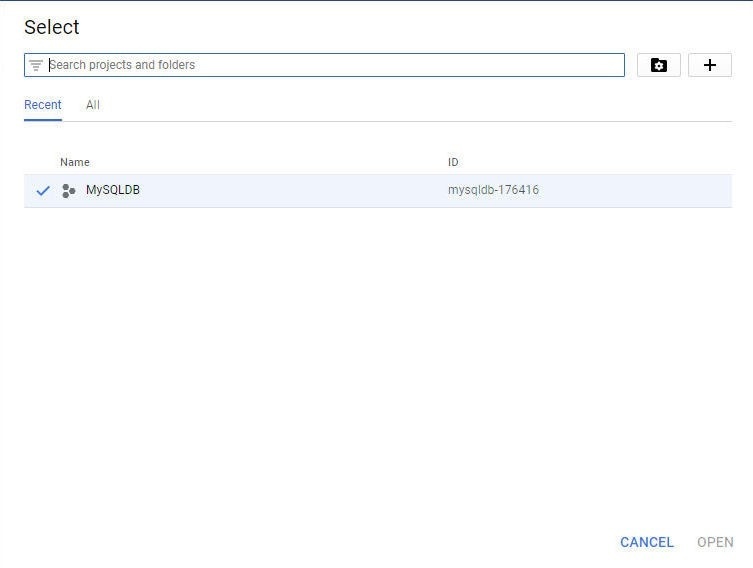 In the New Project wizard specify a Project name (MySQLDB) and click on Create as shown in Figure 3. A new project gets created as shown in the Dashboard in Figure 4. A project that has been created may be selected from the Select a project dropdown as shown in Figure 5. A project that is being created also gets listed with Select a project dropdown, as shown in Figure 6. When the MySQLDB project has been created the icon gets changed to indicate this, as shown in Figure 7. 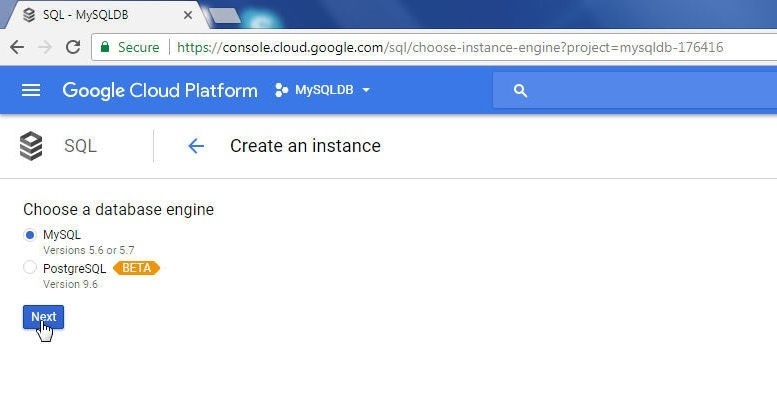 Having created a project, next we shall create a CloudSQL instance for MySQL database. 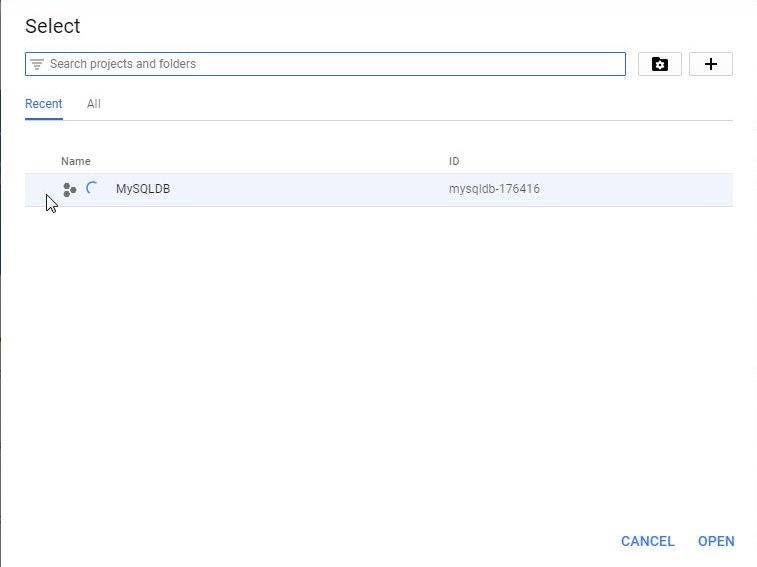 Select the MySQLDB project and click on Create instance as shown in Figure 8. 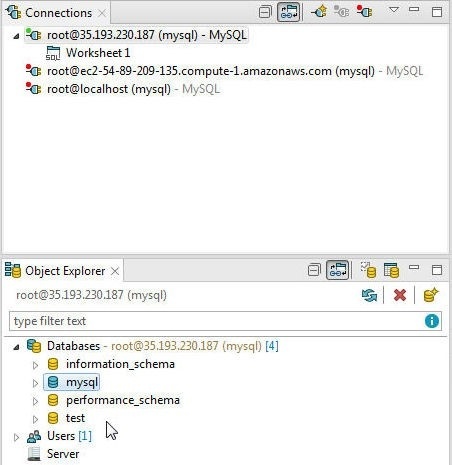 In the Create an instance wizard select MySQL and click on Next as shown in Figure 9. In Choose a MySQL instance type click on Choose Second Generation to select the MySQL Second Generation instance type, as shown in Figure 10. Some of the benefits of the Second Generation instance type are also listed in Figure 10. 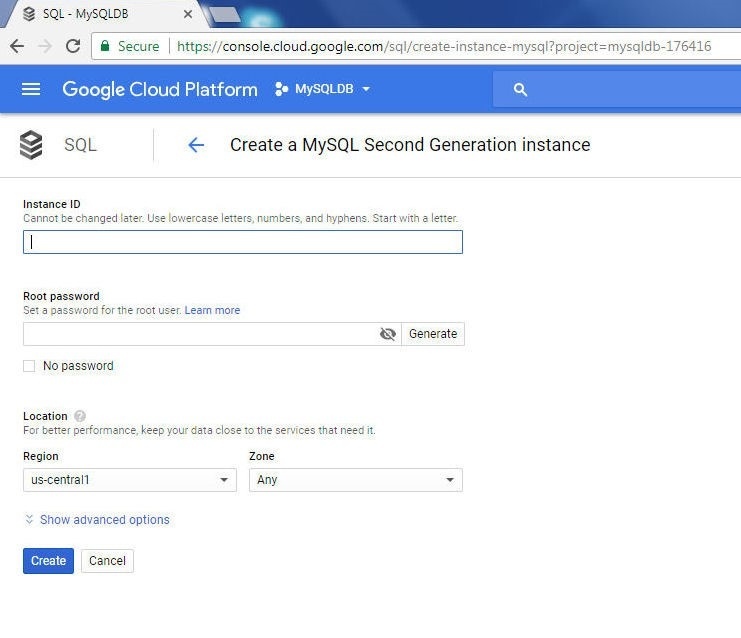 In Create a MySQL Second Generation instance (Figure 11) specify an Instance ID and a Root password, and select a Region and Zone. Click on Show advanced options to list the advanced options, as shown in Figure 12. 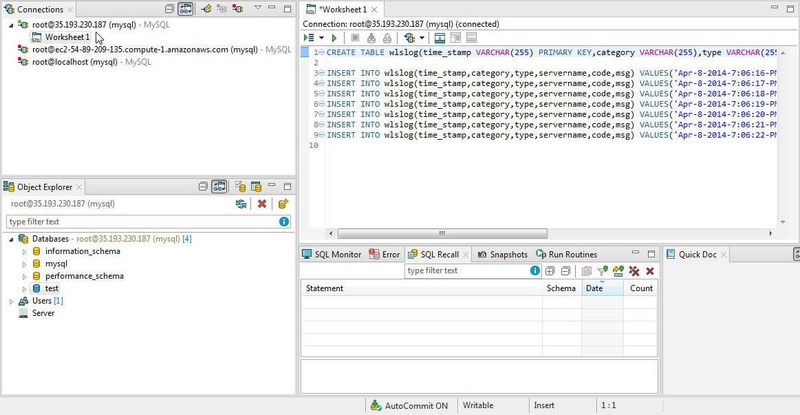 Click on Create to create a MySQL instance as shown in Figure 13. A MySQL instance starts to get created, as shown in the Instances table in Figure 14. When the MySQL instance gets created the icon adjacent to the instance name indicates this, as shown in Figure 15. After creating a MySQL instance several options are available for the new instance; for which, click on the instance management icon for the database instance, as shown in Figure 16. Options include: Edit, Create read replica, Create clone and Delete. Click on Edit to edit an instance. The Edit instance page gets displayed, as shown in Figure 17. Not all MySQL instance settings may be edited. The settings that are not editable are grayed out, such as the Instance ID and Region, as shown in Figure 17. The Machine Type, which sets the vCPUs and Memory may, however, be edited. The Storage type choice (SSD) is permanent, but Storage capacity is editable, as shown in Figure 18. The Enable automatic storage increases option is editable and so is the Automate backups option. Click on the mysqldb link in the Instances table to display the Instance Details, as shown in Figure 19. Toolbar options are provided for Edit, Import, Export, Restart, Stop, Delete, and Clone. 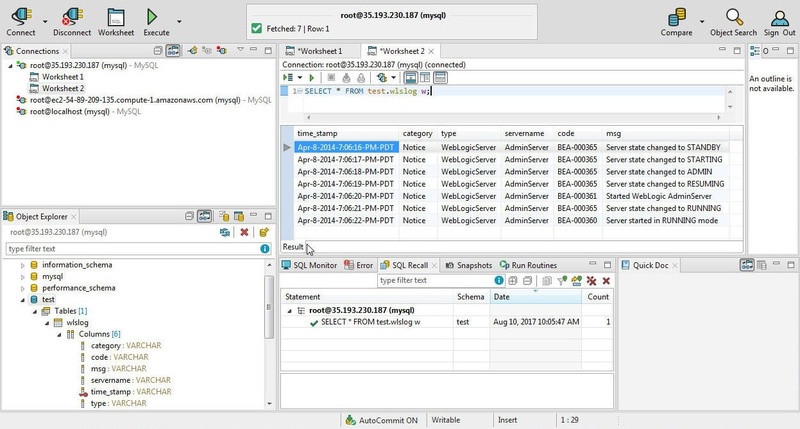 In the Connect to this instance header a Connect using Cloud Shell button is provided. The MySQL instance properties are listed in the Properties header, as shown in Figure 20. Some of the MySQL instance properties, such as Storage used, get listed in the Instances table only after storage has been used, as shown in Figure 21. The Storage Used column was empty when the storage was not being used, as shown above in Figure 16. To be able to connect from Toad Edge to a CloudSQL instance we need to configure access for the IP address on which Toad Edge is running. First, determine the IP address of the machine on which Toad Edge is running. The IP address may be obtained from http://ipv4.whatismyv6.com/ . 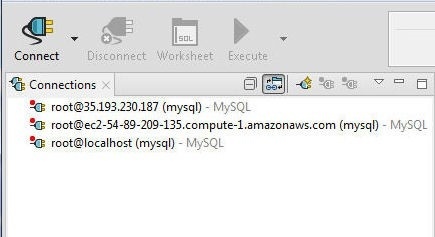 Having obtained the IP address, next we shall add a network consisting of the IP address to the MySQL instance on CloudSQL. Click on the management icon for the MySQL instance and select Edit, as shown in Figure 22. Click on Access Control as shown in Figure 23. Subsequently, click on Add network, which is also shown in Figure 23. Alternatively, click on Add network in Authorized networks as shown in Figure 24. In New network specify a network Name and a Network IP address, as shown in Figure 25, and click on Done. A new network gets added, as shown in Figure 26. Click on Save to save the network. An “Instance is being updated” message gets displayed, as shown in Figure 27. When the instance has been updated the instance icon indicates this, as shown in Figure 28. 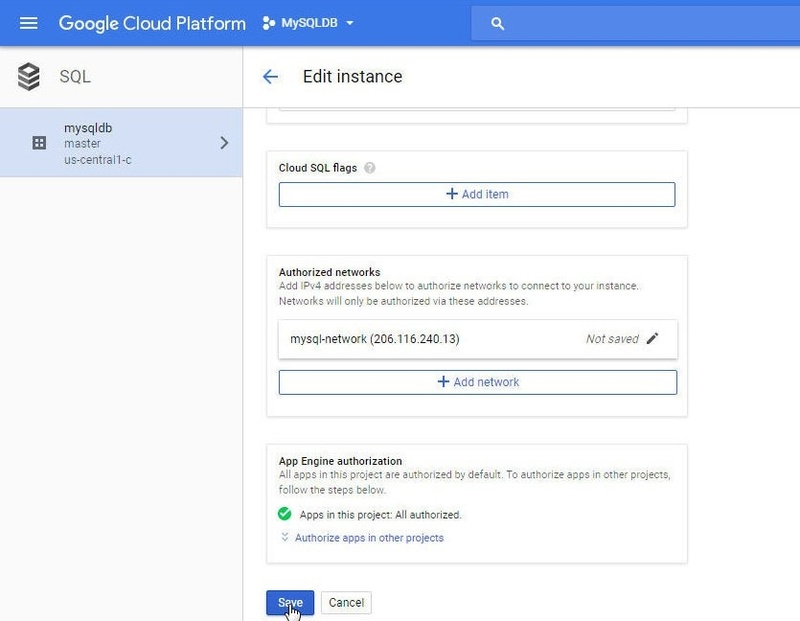 The new network gets listed in Authorized networks on the Instance Details page, as shown in Figure 29. In this section and its subsections we shall use Toad Edge with the MySQL instance on CloudSQL. 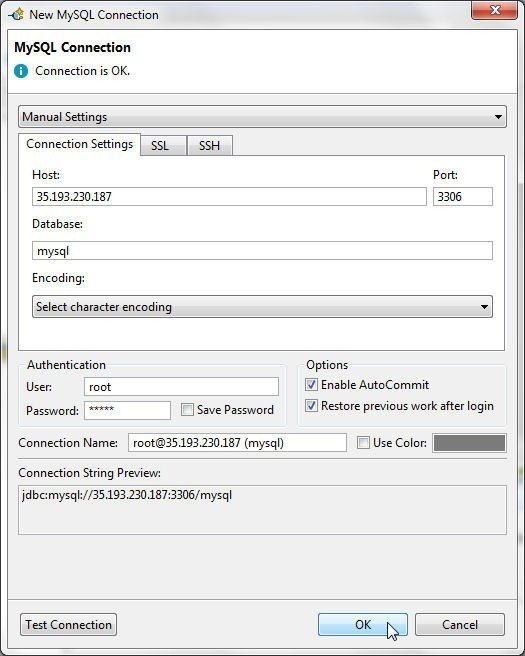 To connect to CloudSQL select Connect>New Connection in Toad Edge as shown in Figure 30. In the New MySQL Connection wizard shown in Figure 31, specify Host, Port, Database, User and Password. Copy the IP Address for the mysqldb CloudSQL instance from the Instances table as shown above in Figures 15 and 16. Add the IP Address to the Host field. Specify Port as 3306, Database as mysql, User as root and the Password as configured for the CloudSQL instance. Keep other settings as the default. Click on Test Connection. If the connection gets established the message “Connection is OK” gets displayed, as shown in Figure 32. If a connection does not get established an error message gets displayed which could be used to fix the issue causing the error. Click on OK.
A new connection gets created and added to the Connections view, as shown in Figure 33. The Object Explorer lists Databases. The database currently being used is indicated by the blue icon, as shown in Figure 34. 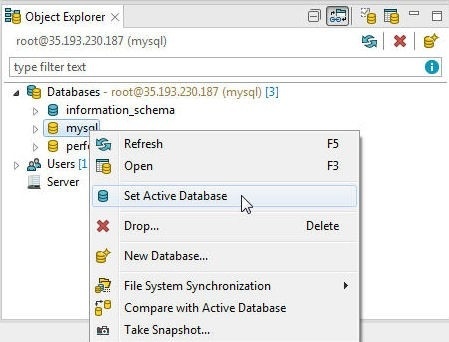 To make another database as the active database, for example, the mysql database, right-click on the database and select Set Active Database, as shown in Figure 35. The mysql database becomes the active database, as shown in Figure 36. 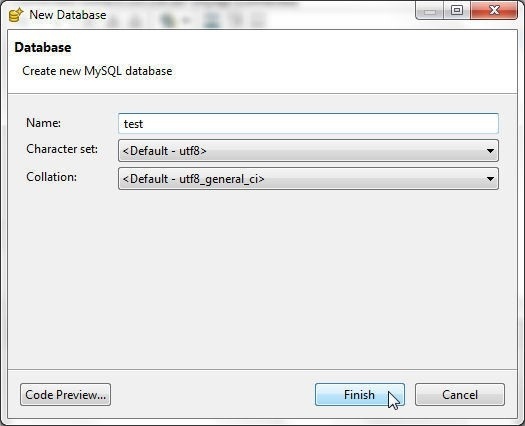 To create a new database click on Create a New Database in Object Explorer as shown in Figure 37. In the New Database wizard specify a database Name (test) and, with the default settings for Character Set and Collation, click on Finish as shown in Figure 38. A new database test gets added, as shown in Figure 39. Set the test database as the active database as explained before in section Setting Active Database by right-clicking on the test database node in Object Explorer>Databases and selecting Set Active Database as shown in Figure 40. The test database becomes the active database, as shown in Figure 41. In this section we shall create a database table in the test database using Toad Edge. We shall use the following SQL script to create a table wlslog. Copy the SQL script to the Worksheet1 as shown in Figure 42. 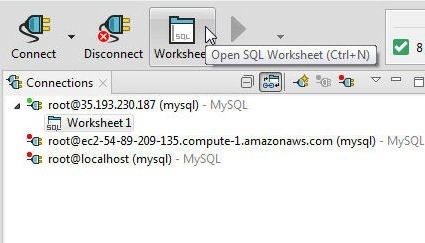 One SQL Worksheet gets created when a new connection is created. Click on Execute All Statements as shown in Figure 43. As a message indicates “8 statements processed” and the SQL Recall lists the SQL statements processed, as shown in Figure 44. The new table wlslog gets listed in the test database in Object Explorer>Tables, as shown in Figure 45. 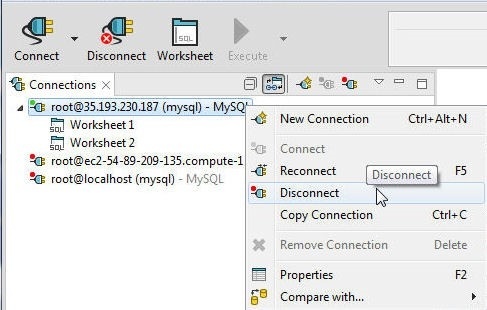 To query the database table created, click on Open SQL Worksheet to add a new SQL Worksheet for the connection, as shown in Figure 46. A new SQL Worksheet Worksheet2 gets added, as shown in Figure 47. 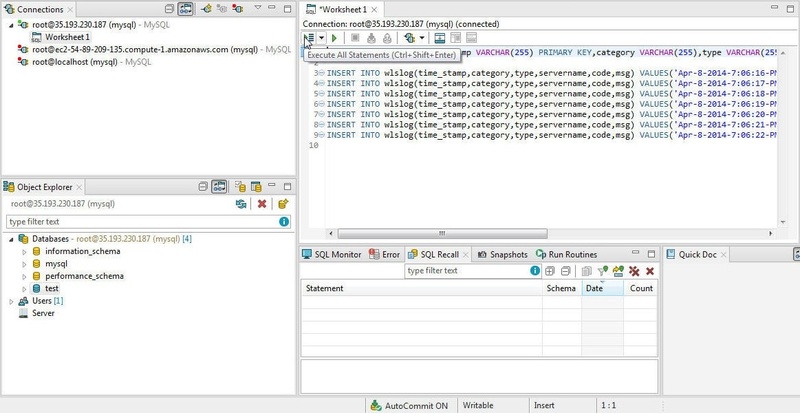 Add a SQL statement in the Worksheet2 SELECT * FROM. A SQL code-assist dialog gets opened. 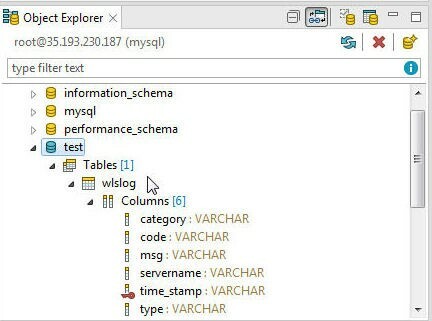 Select the wlslog table in the test database as shown in Figure 48. 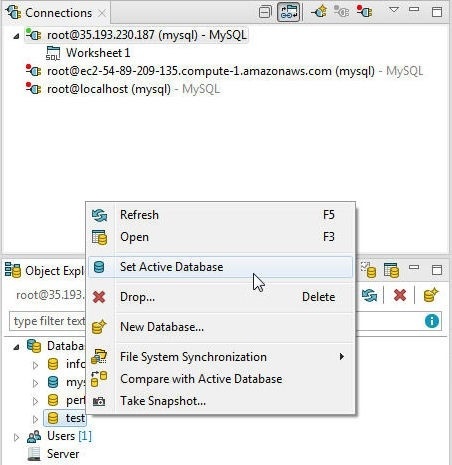 Click on Execute SQL Statement as shown in Figure 49. As the message “Fetched 7” indicates, 7 rows get fetched, as shown in Figure 50. 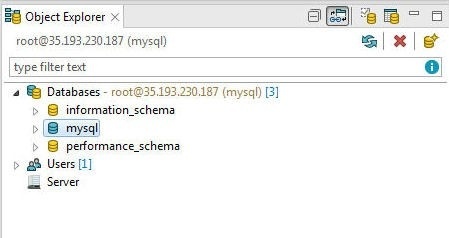 To disconnect from the CloudSQL MySQL instance right-click on the connection and select Disconnect as shown in Figure 51. The connection gets disconnected, as shown in Figure 52. To delete the CloudSQL instance mysqldb select Delete in the Instances table as shown in Figure 53. In the Delete Instance? confirmation dialog add the instance ID mysqldb in the field and click on Delete as shown in Figure 54. 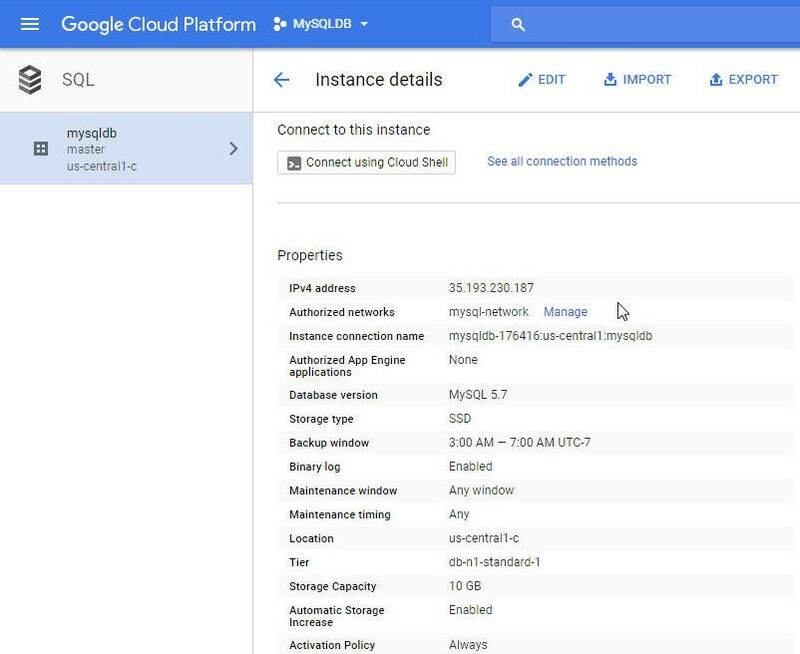 The mysqldb instance gets deleted and does not get listed in the Google Cloud Platform>CloudSQL Dashboard, as shown in Figure 55. 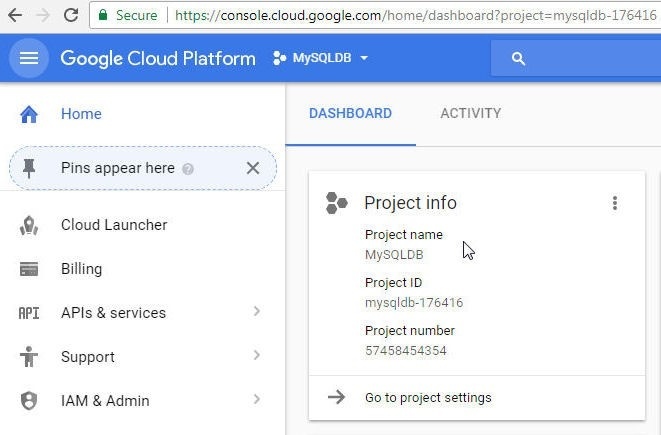 In this tutorial we discussed using Toad Edge with a MySQL database instance on CloudSQL, a managed service for MySQL and PostgreSQL databases on Google Cloud Platform. 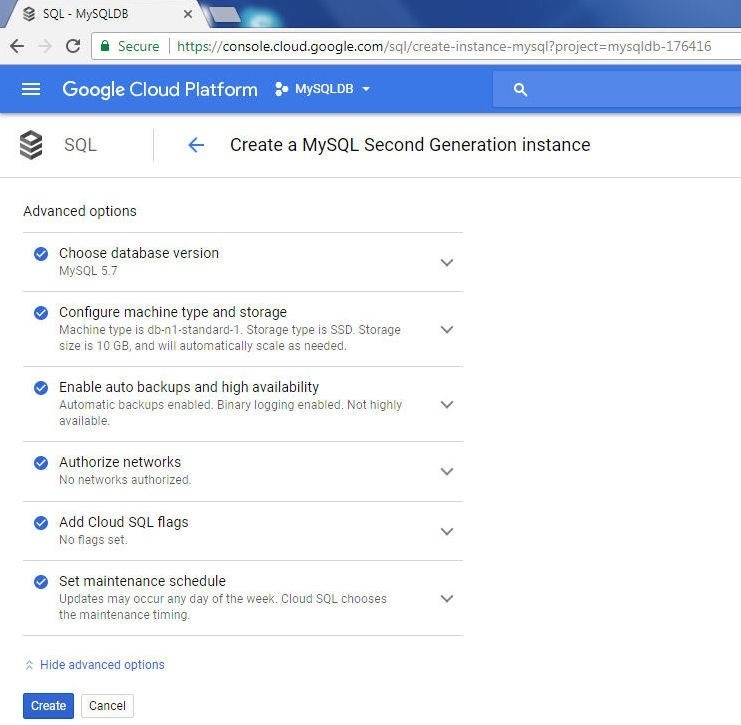 Benefits of CloudSQL include Second Generation instances with support for MySQL 5.6 or 5.7, high availability by replicating data across multiple zones and by automatic failover, flexible and automatically scaling storage up to 10TB based on the InnoDB Storage Engine, secure connections with CloudSQL Proxy and Secure Sockets Layer (SSL). Benefits of Toad Edge include an integrated database development and management environment with built-in support for connecting to MySQL database, running SQL scripts, querying a database, comparing schemas, SQL worksheet code-assist, management of user privileges, Import/Export wizard, and database snapshots.